This study estimates carbon balance in a mixed mature forest on sod-podzolic sandy-loamy soil (Albeluvisols sandy, the Prioksko-Terrasny Nature Reserve) and in a secondary deciduous forest at the Experimental Field Station of the Institute of Physicochemical and Biological Problems of Soil Sciences, Russian Academy of Sciences (gray forest loamy soil, Luvisols loamy). CO2 emissions from soils have been continuously measured every week since 1998. Net primary production was estimated in 2000–2014 by remote sensing using the normalized difference vegetation index. Long-term weather monitoring has revealed a distinctive trend toward increasing aridity of climate in the southern part of Moscow region in the observation period (1998–2014). 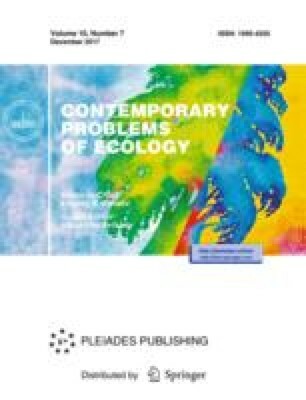 Based on long-term ground-based and satellite monitoring data, this study shows that in the growing season, mixed and deciduous forests of the southern part of Moscow region are the sink of carbon with a mean flux of 41–112 g C m–2, depending on the contribution of root respiration. Taking into account the CO2 emissions from soils during the cold season, the forests are very likely to function as sources of atmospheric carbon at an amount of 30–100 g C m–2 yr–1, sometimes reaching very significant values of C flux (170–300 g C m–2 yr–1). In mature forest ecosystems, a significant influence on the quantitative estimate of the C balance is hampered by the CO2 emission activity from coarse woody debris, which can reach up to 14% of the total losses of C during the decomposition of soil organic matter in the mixed forest, which turns it into a persistent source of CO2 to the atmosphere. It is shown that the sink function of the forest ecosystems was more pronounced in dry years, whereas the excessive wetness diminishes their sink potential, turning the forests into sources of carbon dioxide. Original Russian Text © I.N. Kurganova, V.O. Lopes de Gerenyu, T.N. Myakshina, D.V. Sapronov, I.Yu. Savin, E.V. Shorohova, 2016, published in Lesovedenie, 2016, No. 5, pp. 332–345.